"This year has been our strongest year ever. We doubled our national customer base in the second quarter and we will likely double it again by the end of this quarter ... which translates into a 200% growth over the last 12 months," says Aldo Zini, Aethon President and CEO. According to Mr. Zini, the company plans to add even more employees than he predicted three months ago. "We're on a fast track, we've expanded to the mid-west and it looks like we'll need to ramp up and expand our sales and support staff before the end of this year." 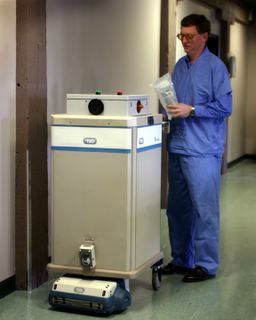 Developed and manufactured in Pittsburgh, Aethon's Tug is the most versatile transport system available in healthcare. TUG rolling hospital cart navigates with a pre-programmed map of the hospital and laser rangefinding to avoid obstacles.